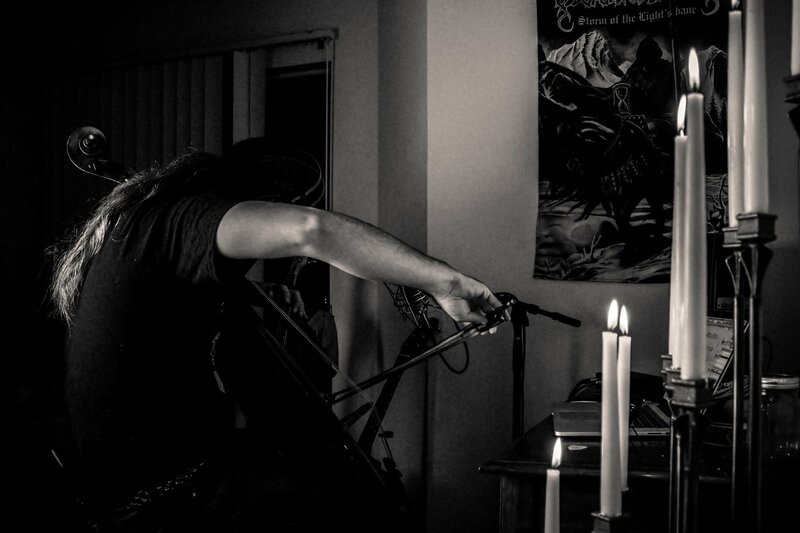 Kakophonix the mastermind behind Hvile I Kaos has been unwavering in his effort to deliver his own brand of Cellistic Black Metal to the masses. October 13th will see the release of the first full length album entitled Agios O Fotiá which translates to “Oh Holy Fire” in Greek. A small label that specializes in the Occult entitled Deathwave Nexion is going to see the release of the album, which has its well deserved spot on the labels roster. Thereafter on October 14th a release show will be held at The 5 Star Bar in Los Angeles where Hvile I Kaos will perform with Ruins ov Abbadon, Imperialist, Solar Haze, and Morphesia. This show is being put together by Church of the 8th Day and The Elegy Ensemble and is sure to please, as it is rounding up some very prominent musicians in the scene. Now if you have kept up with The Metal Wanderlust in the past Hvile I Kaos may be a familiar name and this is not the first time we have featured this unique and talented artist, and hopefully not the last. The single Agios O Baphomet is nothing short of another momentous offering, which is an adaptation of an esoteric chant attributed to the Order of the Nine Angles. Slow brooding layered cello work mingled with guitar draws the listener into an arcane journey, masterful and beautiful. Black Metal riffs transport the being into the fires evoking a presence portrayed in the notes and movements of the song. Quoting Kakophonix himself he states that the tracks on Agios O Fotiá each carry their own esoteric spiritual meaning. If that is an indication as to what there is to expect, this album will be nothing short of spectacular as Kakophonix is a master at portraying emotion and feeling through his music. Open your mind and ears once again, there is a fire burning on the horizon and it’s insatiable flame is to not be quelled.